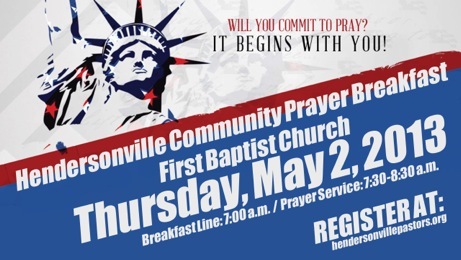 Thursday, May 2, 2013, is the National Day of Prayer, and the Community Pastors Association of Hendersonville is sponsoring a Community Prayer Breakfast. This is a chance for us to demonstrate unity in the Christian faith, and to come together for fellowship and prayer for our nation. The event with take place at First Baptist Church of Hendersonville, with the breakfast line starting at 7:00 a.m., and the prayer time taking place from 7:30 – 8:30 a.m. If your part of CIL, we have a complimentary reservation for you. Please contact me directly or call the church office if you would like to attend as part of our church contingency. If you are a pastor or business owner, and woud like to purchase a table, the cost is only $80 per table (8 spots / table). You can make your reservations today, and pay when you come to the event. You can also buy half a table ($40), or make individual reservations ($10). If you would like to attend, but do not have sufficient funds, please make your reservation anyway, and your reservation will be sponsored.